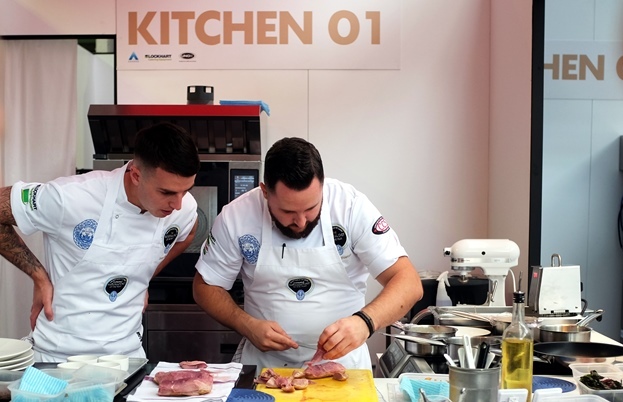 Chef Hayden Groves relives the ups and downs of the National Chef of the Year finals, watching with bated breath at this year’s competition where the 2016 finalists did battle in the kitchen and the ultimate winner was announced. Finally on my third attempt the planets aligned and I entered the ‘Hall of Fame'. 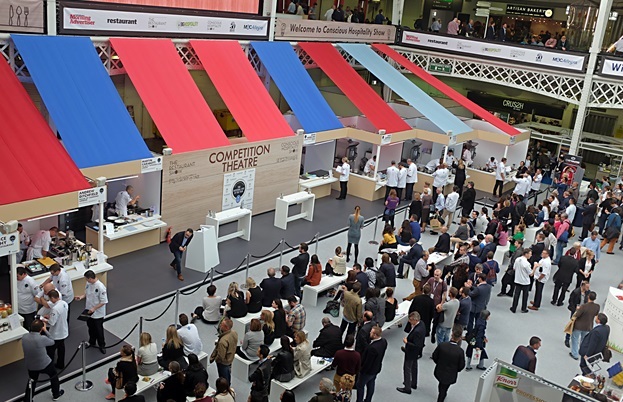 I have proudly been asked to judge the Young National Chef of the Year (YNCOTY) for the last two years and it's not until you step outside the bubble of competing that you realise what a huge competition the NCOTY is. The immense planning and commitment it takes to run, which is chiefly down to two people – David Mulcahy and Clair Bowman. I have to admit I still feel that same buzz every time I walk into the competition theatre. I have really mixed emotions. Longing to go back and relive that special day two years ago. Cooking, cycling, even tiddlywinks; it’s the adrenaline of competing I love, yet I am also slightly relieved that I don’t have that level of pressure that I carry on my shoulders each time I put on a competition jacket. I am very proud and honoured to be listed in the 'Hall of Fame'. I joked on the mic when interviewed that unless they tested me for a retrospective caffeine and a Berroca tablet, my name is there to stay. There is no competition without competitors and what a line up this year’s event had. 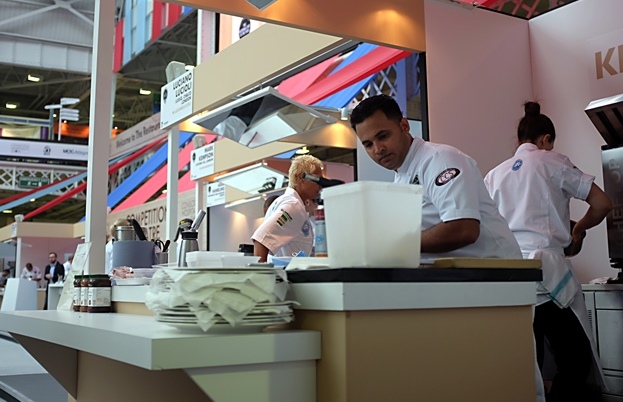 Eight very talented chefs, two of whom had been in the final before, Adam Handling and Larry Jayasekara. Technically you could add a third, Andrew Ditchfield, who assisted another finalist on previous years. This talented pastry chef wanted to prove that his knowledge went far beyond all things sweet and entered under his own name this year. Add a further five new chefs and the competition was on. 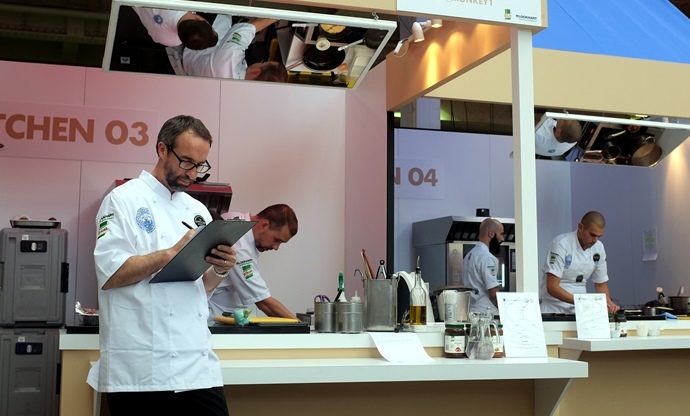 If the chefs competing were an impressive list, the senior judges ramped it up further. 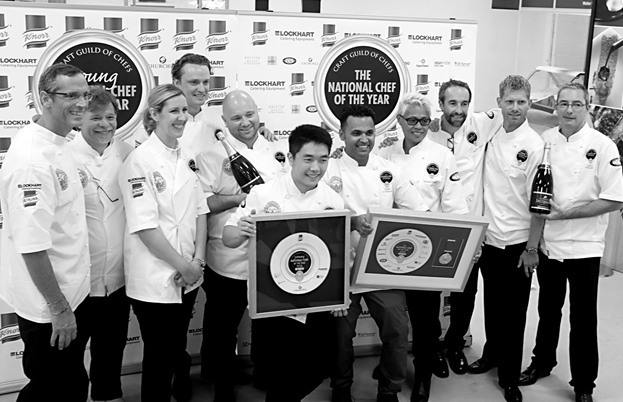 Headed by chair Claire Smyth, she was joined by an array of some of this country’s cooking elite – Phil Howard, Claude Bosi, Monica Galetti, Daniel Clifford, Nigel Haworth, Stephen Terry, James ‘Jocky’ Petrie, Jocelyn Herland, Graham Hornigold and Hideko Kawa, to name only half of the talented decision makers that would decide the 2015–16 winner. Four covers and three courses to produce; two hours on the clock. The time was now or never. Sounds easy right? Factor in the crowd, the foreign environment, cameras and the pressure of the clock, trust me when I say far from it, you are starting from scratch. There is a simple formula in this competition: cook more flavourful and technical dishes than your peers in the allotted time. However, there are some good strategies to employ. Get your starter out in a timely fashion and your food out hot, that’s obvious right? Harder than you may think without a hot plate to keep it all warm and juggling the cooking of the garnish and the protein. Each judge has a different view on presentation, however this carries less influence on the final marks than the overall taste, so the focus should always be on this. Work clean and smart, silly marks are lost for bad practices – particularly hygiene. Two hours completed, each of the judges, divided into sub-groups to focus on starters, mains and desserts, submit their scores. Then the agonising wait for the presentation. First the YNOTY are lined up in front of the audience, then the sponsors and judges are thanked, there’s some nervous fidgeting, then finally Will Torrent the MC makes the announcements in time favoured reverse order. When it comes to the winner, there is an 'X Factor' style longer pause. Danny Hoang from Colette’s at The Grove took the title for YNCOTY 2016 and was absolutely blown away. When the final moments of the big announcement for NCOTY, I was watching Larry on stage and my thoughts turned back to 2013, I knew exactly how he was feeling. The pulse quickens, you feel a shortness of breath and slight dizziness, I’ve either won, or not placed at all. 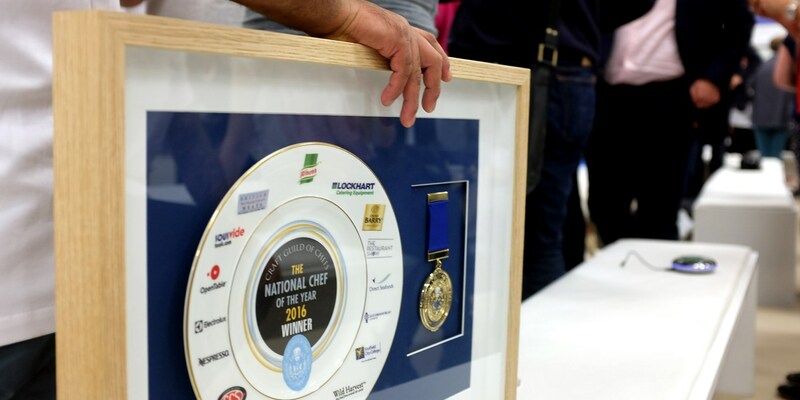 The winner of the NCOTY 2016 is Larry Jayasekara, a huge cheer erupts, a very worthy winner. Larry’s winning menu of Plancha native lobster with leek and red pepper, followed by Roast loin of venison with cavelo nero and blackberries, and a dessert of Chocolate coffee cream with pan-roasted pear was executed in a way that just edged him over a close second placed Paul Foster. It was a competition that I dreamt of winning but never even dared enter until later in my career and hearing Larry’s brief speech, he pretty much stated the same sentiments. 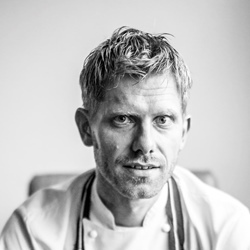 Welcome to the ‘Hall of Fame’ chef!